Take part in an exhilarating skydive with the Army Parachute Association at the UK’s largest skydiving drop zone, whilst supporting Phyllis Tuckwell! The Skydive Centre is between Salisbury and Marlborough, just off the A345. After your training, and being attached to your experienced tandem instructor, the aircraft will climb to 12,000 feet at which point you will prepare to exit the aircraft. During freefall you will experience speeds in excess of 120 miles per hour, falling for approximately 7,000 feet. At 5,000 feet your instructor will deploy the parachute canopy and you will then begin a 5 minute gentle descent down to a designated landing zone. For more details contact Fundraising on 01252 729446 or email fundraising@pth.org.uk. 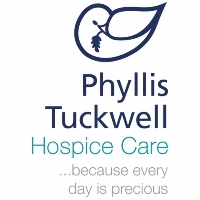 At Phyllis Tuckwell Hospice Care, we provide palliative care for adult patients, and their families, living with cancer or other serious progressive illnesses (such as heart, lung or neurological disease) across the whole of West Surrey and part of North East Hampshire. For over 35 years we have provided supportive and end of life care to local people, serving 550,000 residents. Every day we support over 250 patients, carers and relatives in their own homes, in the community, at the Hospice in Farnham (In-Patient Unit, Day Hospice, Out-Patient appointments and through Patient and Family Support) and at the Beacon Centre in Guildford (Day Services, Out-Patient appointments and through Patient and Family Support). The NHS/Government only covers 20% of our costs, which means we rely heavily on the support and generosity of our local community. All our services are free of charge to our patients and their families, but we need to raise over £20,000 a day to offer such an exceptional standard of clinical care and support. For many patients, when a cure is not possible, Hospice Care helps manage pain and improves the quality of life for both the patient and their family. Seeking care through Phyllis Tuckwell isn’t about giving up hope or hastening death, but rather a way to get the most appropriate care in the last phase of life…because every day is precious.